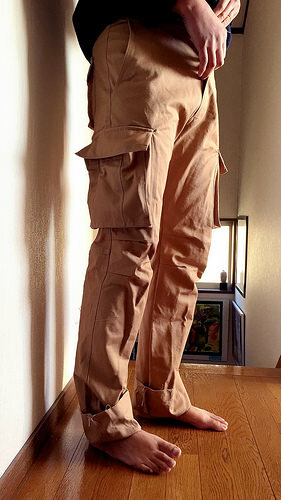 I had been spending several days making a pair of cargo pants for my husband. 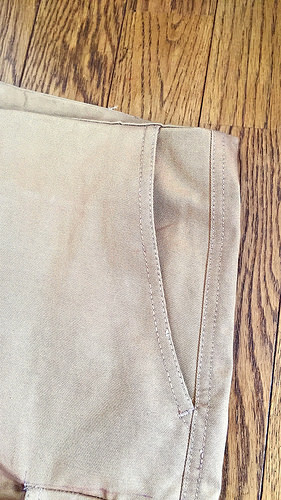 I cut the fabric and happily went sewing all those pockets and flaps. 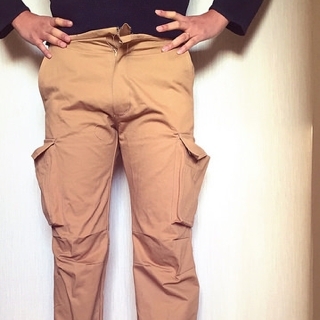 And when he tried them on, the waist is too small! Of course there is noone to blame but myself for not making muslin first or even fit them before everything was too late. But I would like to partly blame my husband for this mishap. 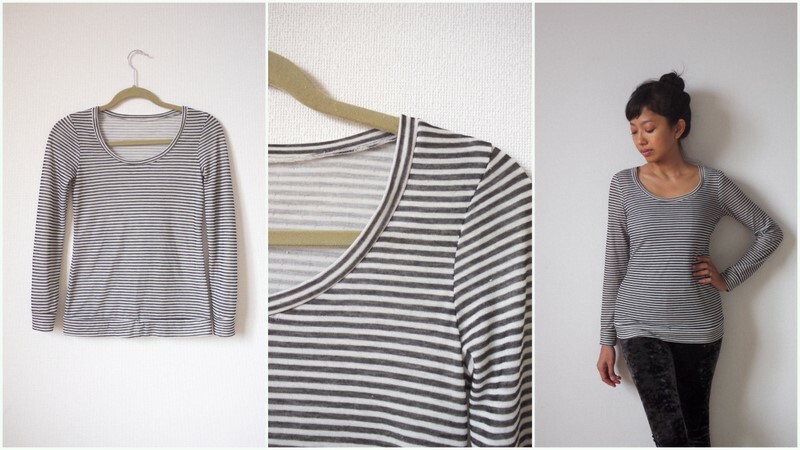 The pattern is from Full of Patterns, a Japanese pattern store where I bought the pattern for my husband’s selvedge jeans. I used size L for the jeans and did a careful fitting from early on. I did think that they were indeed a bit tight at the waist, but my husband convinced me that they fit fine and comfortably. So I was sure that size L would be right for him. 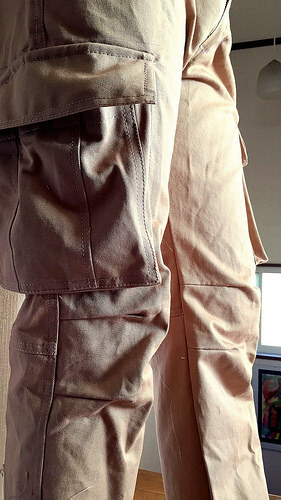 It is somewhat fine for denim fabric to stretch overtime but cotton twill cargo pants are not supposed to behave that way. So this is what happened during fitting. Everything is nice from the legs up but the waist couldn’t close. 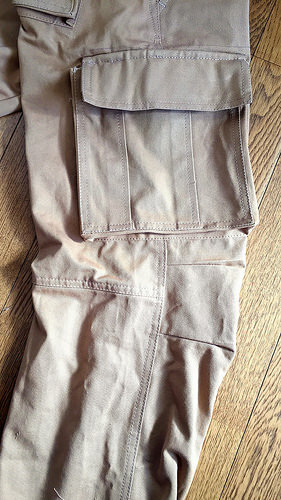 These pants use waist facing instead of waistband so it is really can’t stretch around that area. My husband said that he could do exercise to reduce his stomach but of course that is not how it works. What’s the point of making your own clothes if it is not comfortable? The clothes should follow the body and not the other way around. I was bummed because the pants have all these wonderful details that I had fun making. 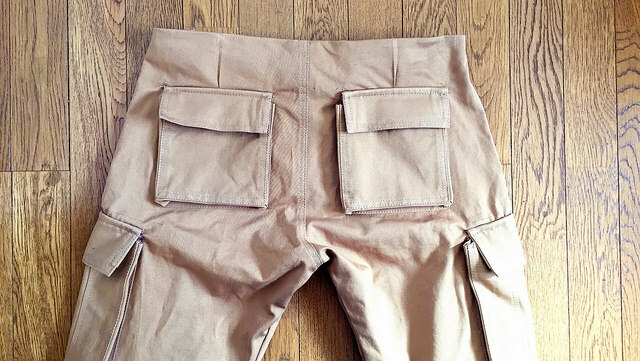 Since I had lost my interest in continuing with the pants, here is some (would have been) wonderful details of the pants. 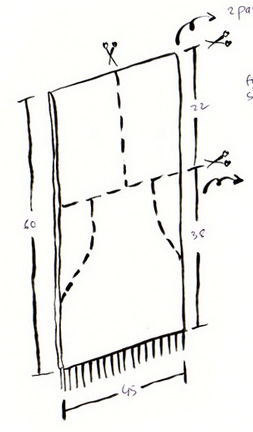 The pants have four darts on each knee, the back leg is two pieces with shaped seams on the back of the knee. The back has a couple of darts, here you can see my failed attempt to open the darts to give more room. 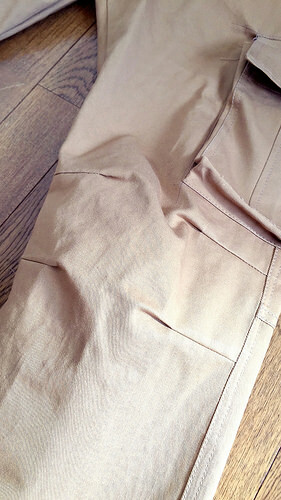 All the pockets are gusseted and double top-stitched. 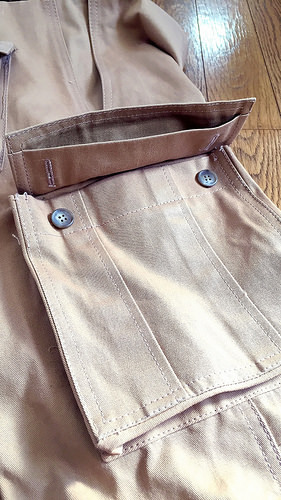 The flaps have underflap with buttonholes, so the buttons are hidden. 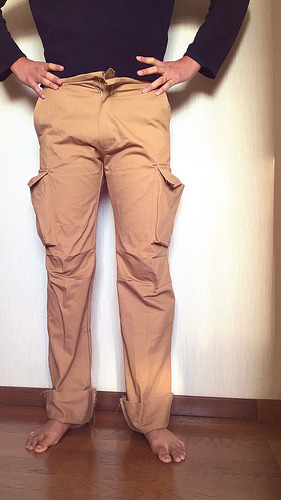 The pants don’t have waistband and instead have waist facing. 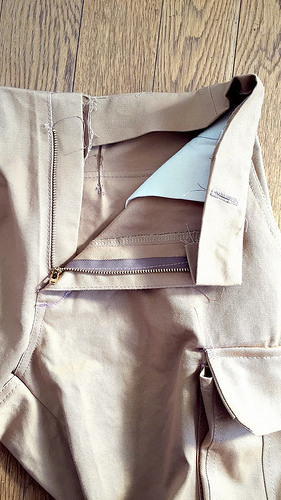 The buttonholes on the waist facing are for inserting twill tape so the waist can be tightened if necessary. Which is not, because the waist is too small! Boo. 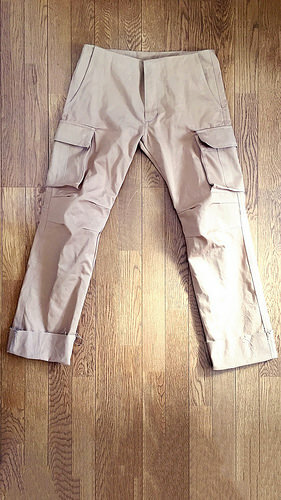 Pattern is Men’s cargo pants FOP-34 by Full of Patterns (Japanese), size L.